Thanks to many individuals for help in putting this together! If you know sources of tryptamines that are not mentioned here or have other comments please mail me. A list of known or possibly psychoactive tryptamines. MAO is the main enzyme that breaks down tryptamines in humans. Enzymes in our bodies also construct tryptamines. The Carriers: Animals, Fungi and Plants. Psychedelic, more earth-bound and less abstract than LSD. Not a stimulant. Phosphate ester is psilocybin. 4,5-MDO-DMT H CH3 CH3 H MeO2 H ? ? ? 5,6-MDO-DMT H CH3 CH3 H H MeO2 >5 ? ? Psychedelic with significant physical side-effects at high doses. 4-HO-DPT H n-prop n-prop H OH H H >20? oral? ? 4,5-MDO-DIPT H i-prop i-prop H MeO2 H >25 oral ? 5,6-MDO-DIPT H i-prop i-prop H H MeO2 ? oral? ? 4-HO-MIPT H i-prop CH3 H OH H H 6 oral ? 5,6-MDO-MIPT H CH3 H H H MeO2 >50 oral ? 4-HO-AMT H H H CH3 OH H H 20 oral ? 5-F-AMT H H H CH3 H F H 25 oral ? Potent MAOI, an antidepressant rather than a psychedelic. Euphoric entactogenesis. Potential treatment for opiate withdrawal. 5-MeO-AET H H H CH2CH3 H OCH3 H 50-75 oral ? serotonin H H H H H OH H 100 oral ? Neurotransmitter, does not pass the blood-brain-barrier. Cardiovascular and autonomic symptoms. pyr-T H tetraMe H H H H ? oral ? NPT H H propyl H H H H ? ? ? NBT H H butyl H H H H ? ? ? NTBT H H t-butyl H H H H 5-20 oral ? 4,alpha-DMT, MP 809 H H H CH3 H CH3 H 60 oral ? 5,alpha-DMT H H H CH3 H CH3 H ? ? ? Induces sleep, resets circadian rhythm. An antioxidant. 6-fluorotryptamine and 5- and 6-fluorotryptophans. Monoamine oxidase (MAO) is the primary inactivation pathway of most tryptamines. That's why inhibitors of the MAO enzyme (MAOIs) can be used to potentiate the effects of tryptamines and to make DMT and 5-MeO-DMT orally active. MAO inhibitors fall into two classes: Irreversible and reversible MAOIs. In addition they can inhibit either or both of the two types of the MAO enzyme, MAO-A and MAO-B which are associated with serotonergic and dopaminergic neurons respectively. Irreversible MAOIs (e.g. the hydrazides iproniazid and phenelzine) bind permanently to the enzyme and cause MAO inhibition lasting 1-2 weeks after ingestion. They are used clinically to treat depression. Reversible MAOIs, such as moclobemide, which is used as an antidepressant, and the beta-carbolines harmine and harmaline, are effective for much shorter time, maybe up to 24 hours. Recreational drug users around the world are using mainly harmine and harmaline despite the lack of scientific studies on their effects on humans. Natives of Amazon have traditionally combined Banisteriopsis caapi vine, which contains harmine, harmaline and related beta-carbolines, with DMT-containing plants to make an orally active brew called ayahuasca (@ Erowid). Other plants containing harmine and/or harmaline can be substituted for B. caapi. The usual 'North American ayahuasca' consists of Peganum harmala ( picture, another picture, seeds and Desmanthus illinoensis roots, and in Australian 'acaciahuasca' leaves of Acacia complanata are combined with material from DMT-containing acacias (the effectivity of this mixture hasn't been confirmed). Nausea is minimized in 'pharmahuasca', which consists of pure DMT and a reversible MAO-inhibitor such as harmine or moclobemide. When the DMT is in a plant extract taking it with a pure MAO inhibiting substance instead of a plant containing MAOIs usually reduces nausea and other body load significantly. MAOIs have also been used to potentiate the effects of mushrooms containing psilocybin and even phenethylamines -- the latter combination can be very dangerous. DPT ingested with MAOIs has been called 'propylhuasca'; DPT is orally active by itself and its dosage should be smaller when potentiated by MAOIs. Peganum harmala (Syrian rue) seeds - pictured - are the most concentrated natural source of harmine and harmaline - about 3% of their weight consists of these alkaloids. Banisteriopsis caapi has been found to contain from 0.18% to 1.36% beta-carbolines, with the concentration of harmine being from 0.057% to 0.635% (McKenna et al. 1984). According to anecdotal reports one gram (corresponding to approx. 30 mg of harmine/harmaline) of P. harmala seeds ingested inhibits MAO enough to make DMT orally active, while 75 mg of moclobemide is sufficient for the same purpose. Harmine and harmaline are hallucinogenic on their own with doses starting from around 300 mg (Naranjo 1967), but often cause physical side-effects such as nausea and tremors in this dose range. They have little emotional or 'psychedelic' effects, but produce strong visual hallucinations. Because of this the natives of Amazon often add larger amounts (75-100 cm of stem per dose) of B. caapi to ayahuasca brew than is needed for MAO inhibition (Luna 1984). The psychedelic effects of moclobemide at normal antidepressant doses (e.g. 150 mg/day) are limited to slight hallucinations of the sense of balance, which is rarely affected by other drugs. A combination of a MAO inhitor and DMT tends to induce drowsiness. Perhaps this is why natives often smoke tobacco and/or drink caffeine-containing drinks while preparing and tripping on ayahuasca. The MAO-B inhibition of nicotine might also be a reason for smoking it, although it is unclear to which extent inhibition of just MAO-B activates or potentiates tryptamines. There are significant dangers in using MAO inhibitors. Most MAOIs potentiate the cardiovascular effects of tyramine and other monoamines found in foods. Ingestion of aged cheese, beer, wine, pickled herring, chicken liver, yeast, large amounts of coffee, citrus fruits, canned figs, broad beans, chocolate or cream while MAO is inhibited can cause a hypertensive crisis including a dangerous rise in blood pressure. You can also look at a more complete list of foods to avoid when receiving MAOI therapy. MAOIs interact with other psychoactive substances in addition to tryptamines; effects of amphetamines, general anaesthetics, sedatives, anti-histamines, alcohol, potent analgesics and anticholinergic and antidepressant agents are prolonged and intensified. Overdosage of MAOIs by themselves is also possible with effects including hyperreflexia and convulsions. It should be noted, however, that these strict warnings apply best in the case of irreversible MAOIs, and many users of reversible MAOIs to activate or potentiate tryptamines are not quite as careful with no apparent ill effects. Tryptamine derivatives and beta-Carbolines have been detected as endogenous metabolites in mammals, including humans. Methyl transferases that catalyze the synthesis of tryptamines, including DMT, 5-MeO-DMT and bufotenine, are found in human lung, brain, cerebrospinal fluid, liver and heart (McKenna & Towers 1984). In the pineal gland MAO is the primary inactivation pathway of serotonin, a neurotransmitter synthesized from the amino acid tryptophan. If MAO is blocked by harmine, harmaline or other MAO inhibitors serotonin can be converted by the methyltransferase enzymes HIOMT and INMT into psychedelic tryptamines (serotonin --(HIOMT)--> 5-MeO-trypt. --(2*INMT)--> 5-MeO-DMT). So, ingesting l-tryptophan to increase serotonin levels, a candy bar to increase the amount of tryptophan getting to your brain and natural plant material containing 25-50 mg harmine/harmaline to block MAO, all at the same time, might cause your pineal gland to synthesize substantial amounts of 5-MeO-DMT (Most 1986). Similar results might be obtained by substituting 5-hydroxytryptophan (5-HTP) for tryptophan. Normal sleep-inducing doses of melatonin have also been taken with reversible MAOIs with the resulting psychoactive effects suggesting significant interaction of the two substances. This is extremely dangerous for persons with existing amine imbalance or schizophrenia. For normal, healthy people possible consequences are bad. A potent inhibitor of INMT, which is a necessary enzyme for the synthesis of DMT and 5-MeO-DMT, is found in particularly high concentrations in the pineal gland. A bypassing or inhibition of the synthesis of this inhibitor might be responsible for trances and other psychedelic states achieved "without drugs" (Strassman 1990). See Strassman's article for more info and speculation about the pineal gland. Many animals, including mammals, contain psychoactive tryptamines. Below are two examples. Small amounts of DMT and 5-MeO-DMT can be found in the cerebrospinal fluid of psychiatrically normal humans, schizophrenics and manics (Corbett et al. 1978). Profound alteration of consciousness within a few seconds of exhaling. I relax into a deep, peaceful interior awareness. There is nothing scary about the effects and no sense of toxicity. I try to describe my feelings but am unable to talk for the first five minutes and then only with some difficulty. This is a powerful psychoactive drug, one that I think would appeal to most people who like the effects of hallucinogens. For the next hour I feel slow and velvety, with a slight pressure in my head. No long-lasting effects to report. (Andrew T. Weil, personal observation, January 12, 1991). Other animals contain DMT such as the gorgonian Paramuricea chamaeleon (Cimino & De Stefano, 1978). The psychoactive tryptamines in fungi are mainly psilocybin and psilocin although others are also present. Paul Stamets has compiled a comparison of combined maximum percentages of psilocybin, psilocin and baeocystin in 11 species of Psilocybe. C. cyanopus (Benedict et al. 1962) and C. smithii (Benedict et al. 1967) contain psilocybin and psilocin while C. kuehneriana contains psilocin only (Ohenoja et al. 1987). C. siligineoides may also contain these alkaloids (Schultes & Hofmann 1979 p. 40). All species contain psilocin and psilocybin, for C. cyanescens (Schultes & Hofmann 1979 p. 40) and for C. cambodginiensis as well as C. tropicalis (Arora, 1986), and for C. anomala as well as C. bispora (Merlin & Allen, 1993). Several Panaeolus species contain psilocybin. For P. antillarum refer to Allen et al. (1991), for P. ater refer to Bresinsky et al. (1990), for P. papilionaceus (Gurevich et al. 1992), for P. retirugis (Fiussello et al. 1971/72), for P. separatus ((Miller Jr. 1972), for P. sphinctrinus (Hein & Wasson, 1958 p. 322) and for P. olivacens (Ohenoja et al. 1987). [Erowid Note: Alan Rockefeller states that Panaeolus antillarum, Panaeolus ater, Panaeolus campanulatus, Panaeolus retirugus, Panaeolus sphinctrinus, are all false positives.] P. subbalteatus contains both psilocin and psilocybin (Ohenoja et al. 1987) but was known to be hallucinogenic since 1959 (Stein, 1959). P. firmicola is also described as hallucinogenic and probably contains the same alkaloids (Schultes, 1979). Contains psilocybin and psilocin (Besl, 1993). Many Gymnopilus contain psilocybin, for G. aeruginosus, G. luteus, G. spectabilis, G. validipes and G.viridans refer to Hatfield et al. (1978). For G. liquiritiae (Koike, 1981) and for G. purpuratus (Gartz 1991). These contain psilocin and psilocybin, for P. aeruginascens see Haeselbarth et al. (1985) and for the others Stijve et al. (1985). Species: humei Murrill also known as peele "Peele's Lepiota"
P. atricapillus contains psilocybin (Ohenoja et al. 1987) while P. salicinus (Saupe 1981), P. nigroviridis (Christiansen et al. 1984) and P. glaucus (Stijve & De-Meijer 1993) contain psilocin and psilocybin. There are at least 75 mushroom species in this genera that contain psilocin and psilocybin in Guzman 1983, and there are several more recently discovered species such as P. aucklandii (Guzman et al. 1993), P. samuiensis (Guzman et al. 1991) and P. antioquensis, P. beliconiae, P. guatapensis and P. subacutipilea (Guzman et al. 1994) and P. makarorae (Johnston & Buchanan 1995). Also P. coprophila, while lacking psilocin (making it a non-blueing psilocybe) is known to contain psilocybin (Arora, 1986). P. crobulus is also known to be hallucinogenic (Phillips, 1981). Waikas of Orinoco headwaters in Venezuela add dried and pulverized leaves of this herb to their Virola-snuff. Intensely aromatic smelling leaves probably contain tryptamines (Schultes 1977). Contains DMT and N-methyltryptamine (Rivier & Pilet, 1971). Crouch et al. (1992) reported finding DMT in brown seaweed extract sold as Kelpak and intended to be used as a plant fertilizer. However, subsequent analysis by J. Gartz suggests none is present. May contain DMT but the specimen used may have been misidentified (Smith 1977). These cacti growing in Mexico are known to Tarahumare Indians as peyote or hikuli and used in their festivals. E. triglochidiatus contains a tryptamine derivative, possibly 5-MeO-DMT (Bye 1979). E. salm-dyckianus is also supposed to contain tryptamines according to Horus Botanicals catalog 1992. DMT has been isolated from this species growing in North-Western Argentina (Schultes & Hofmann 1979 p. 58). Leaves and stem contain 0.4-0.5% tryptamine, DMT and other alkaloids (Johns et al. 1966). Leaves, root, stem and seeds contain DMT and 0.06% 5-MeO-DMT of wet weight (Banerjee & Ghosal 1969). Leaves and root contain DMT and 5-MeO-DMT (Smith 1977). Seeds of this hardy perennial shrub are available from commercial suppliers. Leaves, stem and fruit of this jungle vine contains DMT and 5-MeO-DMT (Ghosal et al., 1971). Seeds are available from commercial suppliers. Dried plant material produced 0.2% 5-MeO-DMT and small amounts of DMT (Ghosal & Mukherjee 1966). Columbus first noted the use of a snuff made from A. peregrina called Cohoba by the Taino Indians of an island called Hispaniola. Black beans from this tree (and possibly others above) are toasted, pulverized and mixed with ashes or calcined shells to make psychedelic snuff called yopo by Indians in Orinoco basin in Colombia, Venezuela and possibly in southern part of Brasilian Amazon. Yopo is blown into the nostrils through bamboo tubes or snuffed by birdbone tubes. Its use was first reporter in 1801 by A. von Humboldt and was later studied by R. Spruce. Snuff made from A. colubrina is called vilca in Bolivia, and might have been used as an enema by the Incas. The trees grow in open plain areas, and leaves, bark and seeds contain DMT, 5-MeO-DMT and related compounds (Schultes 1976, 1977; Pachter et al. 1959; Phytochem 11, 737). Smoking half a gram of A. colubrina seeds has been reported to give a mild psychedelic effect. Dried A. confusa stems contain 0.04% N-methyltryptamine and 0.02% DMT (Arthur et al. 1967). The dried leaves of A. phlebophylla contain 0.3% DMT (Rovelli & Vaughan 1967). The bark of A. maidenii contains 0.6% of N-methyltryptamine and DMT in the proportions approx. 2:3 (Fitzgerald & Sioumis 1965). A. simplex also contains DMT (Poupat et al. 1976). Several Sudanese species have DMT (Wahba & Elkheir, 1975). Seeds of several acacia species are available from commercial suppliers. Species: illinoensis pictured (pictures @ Erowid) "Illinois Bundleflower"
Thompson et al. report that the root bark of this North American perennial shrub contains 0.34% DMT and 0.11% N-methyltryptamine. The bark accounts for about a half of the total weight of the roots. The plant should be resistant to cold and draught and easy to grow. D. illinoensis seeds, dried root and dried root bark can be ordered from several suppliers. Seeds are also available from more main-stream mail-order houses. The roots of M. hostilis, which is not the common houseplant M. pudica ("sensitive plant"), contain 0.57% DMT and are used by Indians of Pernambuso State in Brazil as part of their Yurema cult (Pachter et al. 1959, Schultes 1977, (Meckes-Lozoya et al. 1990). The root bark can be powdered e.g. in a coffee grinder, boiled in 30% lemon juice for an hour and strained through a paper filter to produce liquid for ingestion. 8-20 g of the root bark prepared this way has been reported to give a trip with nausea, both the intensity of the psychedelic effect and the nausea being strong at the 20 g dosage. An acid-base extraction method (involving e.g. hydrochloric acid, sodium hydroxide and petroleum ether with CaCO2 for drying) can be used to get DMT crystals, which can then be smoked (below, a recipe for Phalaris). As M. hostilis root bark is one of the most concentrated plant sources of DMT mild effects can be felt from smoking ground bark. M. scabrella contains DMT and N-methyltryptamine (De Moraes et al., 1990). Bark of M. verrucosa also contains DMT (Smith 1977). Contains DMT (Leboeuf et al., 1977). Both contain DMT (Smith 1977). Natives of western Amazon add DMT- and N-methyltryptamine containing leaves of the vine D. cabrerana to a drink made from Banisteriopsis caapi, which contains beta-carbolines harmine and harmaline (Schultes 1977, Smith 1977). D. cabrerana is also known as Banisteriopsis rusbyana. 3-8 leaves of this plant can be boiled in water containing lemon juice for one or two hours and filtered to produce a relatively easily ingested liquid that is active when combined with MAO-inhibitors. With 6 leaves the psychedelic effect from such a brew has been reported to be strong, with minimal nausea compared to e.g. M. hostilis. Contains 5-MeO-DMT as well as a beta-carboline (Jossang et al. 1991). The bark contains 5-MeO-DMT (Holmstedt et al. 1980). The bark resin of these trees is used to prepare hallucinogenic snuffs in northwestern Brazil by boiling, drying and pulverizing it. Sometimes leaves of a Justicia are added. The snuff acts rapidly and violently, "effects include excitement, numbness of the limbs, twitching of facial muscles, nausea, hallucinations, and finally a deep sleep; macroscopia is frequent and enters into Waika beliefs about the spirits resident in the drug." Snuffs made from V. theiodora bark contain up to 11% 5-MeO-DMT and DMT. Also leaves, roots and flowers contain DMT. Amazonian Colombia natives roll small pellets of boiled resin in a evaporated filtrate of bark ashes of Gustavia Poeppigiana and ingest them to bring on a rapid intoxication (Smith 1977, Schultes 1977). DMT has been isolated from Pandanus nuts growing in New Guinea (Barrau 1958, 1962). Leaves, flowers and rhizomes contain DMT, bufotenine and related compounds (Ghosal et al. 1972). Leaves of P. arundinacea and leaves and seedlings of P. aquatica contain DMT, 5-MeO-DMT and related compounds (Smith 1977). P. arundinacea plants are available from commercial suppliers. Jim DeKorne (1996) has reported that strong varieties of P. Arundinacea can be processed simply with a wheatgrass juicer to yield a liquid that is potent enough for one teaspoon to be effective with MAOIs. He has prepared a potent smokable extract as follows: grass clippings are pulverized and water is added to make a pourable mixture, which is then acidified to about pH 5. The mix can then be heated overnight while evaporation is not allowed. The plant matter is separated by first using a cheesecloth and then a paper coffee filter. 10-15% of the mass of the resulting solution of a "defatting solvent" (e.g. methylene chloride, ether, chloroform, or naptha) is then added. After vigorous shaking the water containing the alkaloids is separated from the solvent. A base is added to the aqueous solution in small increments until the pH gets to about 9 or 10, which converts the alkaloids into their free base. Extraction is then performed four times with an organic solvent, comprising 10% of the mass of the solution, first after 24 hours and then at three weekly intervals, while the solvent layer takes on a darker tint (usually yellowish or reddish-brown). In total the extraction takes almost a month and the solution should be shaken at least twice a day between extractions. To isolate the alkaloids the solvent is finally evaporated from the combined extract fractions. Rhizomes contain DMT (Wassel et al. 1985). 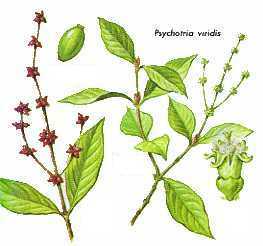 Psychotria leaves are added to a hallucinogenic drink prepared from Banisteriopsis caapi and B. rusbyana (which contain beta-carbolines) to strengthen and lengthen the effects in western Amazon. P. carthaginensis and P. viridis both contain DMT (Rivier, 1972). P. viridis seeds are available from commercial suppliers. Bark contains 0.04% 5-MeO-DMT (Pachter et al. 1959). Contains DMT (Abu Zarga, 1986). Contains 5-MeO-DMT as well as 5-MeO-DMT-Oxide and a beta-carboline (Skaltsounis et al. 1983). The leaves and branches contains up to 0.2% DMT (Kan-Fan 1970). Contains DMT (Grina et al., 1982). Abu Zarga, M.H. 1986. Three new simple indole alkaloids from Limonia acidissima. Lloydia 49(5), 901-904. Akers, B.P. 1992. Peele's Lepiota: An identification and a clarification. Mycotaxon 43(0), 461-469. Arora, D. 1986. Mushrooms Demystified: A Comprehensive Guide to the Fleshy Fungi. Ten Speed Press, Berkeley. Arthur, H.R., Loo, S.N. & Lamberton, J.A. 1967. Nb-methylated tryptamines and other constituents of Acacia confusa Merr. of Hong Kong. Aust. J Chem. 20, 811. Banerjee, P.K. & Ghosal, S. 1969. Simple indole bases of Desmodium gangeticum. Aust. J Chem. 22, 275-277. Nouvelles observations au sujet des plantes hallucinogenes d'usage autochtone en Nouvelle-Guinee. J Agric. Trop. Bot. Appl. 5, 377-378. Observations et travaux recents sur les vegetaux hallucinogenes de la Nouvelle-Guinee. J Agric. Trop. Bot. Appl. 9, 245-249. Benedict, R.G., Brady, L.R., Smith, A.H. & Tyler, V.E. 1962. Occurrence of psilocybin and psilocin in certain Conocybe and Psilocybe species. Lloydia 25, 156-159. Benedict, R.G., Tyler, V.E. & Watling, R. 1967. Blueing in Conocybe, Psilocybe and a Stropharia Species and the Dectection of Psilocybin. Lloydia 30(2), 150-157. Galerina steglichii spec. nov., a hallucinogenic Galerina. Zeitschrift fuer Mykologie 59(2), 215-218. Bresinsky, A. & Besl, H. 1990. A Colour Atlas of Poisonous Fungi. Wolfe Publishing Ltd, London. Hallucinogenic plants of the Tarahumara. J. Ethnopharmacology 1, 23-48. Corbett, L., Christian, S.T., Morin, R.D., Benington, F. & Smythies, J.R. 1978. Hallucinogenic N-methylated indolealkylamines in the cerebrospinal fluid of psychiatric and control populations. British J. Psychiatry 132, 139. Christiansen, A.L., Rasmussen, K.E. & Hoeiland, K. 1984. Detection of psilocybin and psilocin in Norwegian species of Pluteus and Conocybe. Planta Med. 50, 341-343. Cimino, G. & De Stefano, S. 1978. Chemistry of Mediterranean Gorgonians. Simple indole derivatives from Paramuricea chamaeleon. Comptes Rendus Biochem. Physiol. Ser. C. 61, 361-362. Crouch, I.J., Smith M.T., Van Staden J., Lewis, M.J. & Hoad, G.V. 1992. Identification of auxins in a commercial seaweed concentrate. J Plant Physiology 139(5), 590-594. Daly, J.W. & Witkop, B. 1971. Chemistry and pharmacology of frog venoms. In: Venomous animals and their venoms. Vol II. New York: Academic Press. Davis, W. & Weil, A.T. 1992. Identity of a New World Psychoactive Toad. Ancient Mesoamerica 3 (1992) 5, 51-59. Ayahuasca analogs and Plant-Based Tryptamines. De Moraes, E.H.F., Alvarenga, Z.M.A., Ferreira, Z.M.G.S. & Alisue, G. 1990. Fitzgerald, J.S. & Sioumis, A.A. 1965. Alkaloids of Australian Leguminosae V. Aust. J Chem. 18, 433. Fiussello, N. & Ceruti-Scarti, J. 1971/72. Presenza di psilocibina edi 5-idrossi-indolderivati in Panaeolus retirugis. Atti Acc. Sci. Torino 106, 725-735. Influence of phosphate on fruiting and secondary metabolism of mycelia of Psilocybe cubensis, Psilocybe semilanceata and Gymnopilus purpuratus. Zeitschrift fuer Mykologie 57(1), 149-154. Ghosal, S., Chaudhuri, R.K., Dutta, S.K. & Bhattacharya, S.K. 1972. Occurrence of curaromimetic indoles in the flowers of Arundo donax. Planta Med. 21, 22. Ghosal, S. & Mukherjee, B. 1966. Indole-3-alkylamine Bases of Desmodium pulchellum. J, Org. Chem. 31, 2284. Ghosal, S., Singh, S. & Bhattacharya, S.K. 1971. Grina, J.A. et al. 1982. Constituents of Zanthoxylum aborescens. Part 7. Old & new alkaloids from Zanthoxylum aborescens. J. Organic Chemistry 47, 2648-2651. Indole derivatives in certain Panaeolus species from East Europe & Siberia. Mycological Research 97(2), 251-254. Gurevich, L.S. & Astapenko, V.V. 1992. Chromatographic study of some indole metabolites in Panaeolus basidiomycetes. Mikologiya I Fitopathologiga 26(3), 189-194. The Genus Psilocybe. Beihefte Zur Nova Hedwingia 74, 1-439. Guzman, G., Bandala, V.M. & Allen, J.W. 1993. A New Bluing Psilocybe from Thailand. Mycotaxon 26, 155-160. Guzman, G., Bandala, V.M. & King, C. 1991. A New Species of Psilocybe of Section Zapotecorum from New Zealand. Mycological Research 95, 507-508. Guzman, G., Saldarriaga, Y., Pineda, F., Garcia, G. & Velazquez, L.F. 1994. New Species of Psilocybe from Colombia and Discussion on the known species. Mycotaxon , 225. Haeselbarth, G., Michaelis, H. & Salnikow, J. 1985. Nachweis von Psilocybin in Inocybe aeruginescens. Mykol. Mitt. bl. 28(1), 59-62. Hatfield, G.M., Valdes, L.J. & Smith, A.H. 1978. The occurrence of psilocybin in Gymnopilus species. Lloydia 41, 140-144. Hein, R. & Wasson, R.G. 1958. Les champignons hallucinogenes du Mexique. Museum National d'Histoire Naturelle, Paris. Holmstedt, B., Lindgren, J.E., et al. 1980. Indole alkaloids in Amazonian Myristicaceae: Field and laboratory research. Bot. Mus. Leafl., Harvard Univ. 28, 215-234. Johns, S.R., Lamberton, J.A. & Sioumis, A.A. 1966. Alkaloids of the Australian Leguminosae VI. Aust. J Chem. 19, 893. Johnston, P.R. & Buchanan, P.K. 1995. The genus Psilocybe (Agaricales) in New Zealand. New Zealand Journal Botany 33(3), 379. Jossang, A., Jossang, C., Hadi, H.A., Sevenet, T. & Bodo, B. 1991. Horsfiline, an oxindole alkaloid from Horsfieldia superba. J. Organic Chem. 56(23), 6527-6530. Kan Fan, C. et al. 1970. Alcaloides de Vepris ampody (Rutacees). Phytochem. 9, 1283-1291. Kantor, R.E., Dudlettes, S.D. & Shulgin, A.T. 1980. 5-Methoxy-alfa-methyl- tryptamine (alfa,O-dimethylserotonin), a hallucinogenic homolog of serotonin. Biological Psychiatry Vol 15, 349-352. Koike, Y., Wada, K., Kusano, G., Nozoe, S., & Yokoyama, K. 1981. Isolation of Psilocybin from Psilocybe argentipes and its Determination in Specimens of some Mushrooms. Lloydia 44(3), 362-365. Leboeuf, M. et al., 1977. Alkaloids and triterpenes of Testulea gabonensis. Plant Medicine Phytotherapy 11, 230. The Healing Practices of a Peruvian Shaman. J. Ethnopharmacology 11, 123-133. McKenna, D.J., Towers, G.H.N., & Abbott, F. (1984). Monoamine oxidase inhibitors in South American hallucinogenic plants: Tryptamines and Beta-carboline constituents of ayahuasca. J Ethnopharmacology 10, 195-223. Mckenna, D.J. & Towers, G.H.N. 1984. Biochemistry and Pharmacology of Tryptamines and beta-Carbolines: A Minireview. J Psychoactive Drugs 16(4). Meckes-Lozoya, M., Lozoya, X., Marles, R.J., Soucy-Breau, C., Sen, A. & Arnason, J.T. 1990. N,N-dimethyltryptamine alkaloid in Mimosa tenuiflora bark (tepescohuite). Arch. Invest. Med. Mex. 21(2), 175-7. Merlin, M.D. & Allen, J.W. 1993. Species identification and chemical analysis of psychoactive fungi in the Hawaiian islands. Journal of Ethnopharmacology 40(1), 21-40. Mushrooms of North America. Dutton & Co., Springfield. Bufo Alvarius: the Psychedelic Toad of the Sonoran Desert. Venom Press Box 2863 Denton TX 76202. Eros and the Pineal: the layman's guide to cerebral solitaire. Venom Press, Denton, TX. Psychotropic Properties of the Harmala Alkaloids. In: Efron (Ed.) The Ethnopharmacologic Search for Psychoactive Drugs. Ohenoja, E., Jokiranta, J., Makinen, T., Kaikkonen, A. & Airaksinen, M.M. 1987. The Occurrence of Psilocybin and Psilocin in Finnish Fungi. Lloydia 50(4), 741-744. Ott, J. 1993. Pharmacotheon. Pangean Entheogens. Ott, J. 1994. Ayahuasca Analogues. Natural Products Co..
Pachter, I.J, Zacharias, D.E & Ribeir, O. 1959. Indole Alkaloids of Acer saccharinum (the Silever Maple), Dictyoloma incanescens, Piptadenia colubrina, and Mimosa hostilis. J Org Chem 24, 1285-7. Mushrooms and other fungi of Great Britain and Europe. Pan Books, London. Poupat, C., Ahond, A. & Sevenet, T. 1976. Alcaloides De Acaia simplicifolia. Phytochemistry 15, 2019-2120. Rivier, L. & Lindgren, J-E. 1972. "Ayahuasca," the South American Hallucinogenic Drink: an Ethnobotanical and Chemical Investigation. Economic Botany 26, 101-129. Rivier, L. & Pilet, P.E. 1971. Robbers, J.E., Tyler, V.E. & Ola'h, G.M. 1969. Additional evidence supporting the occurrence of psilocybin in Panaeolus foenisecii. Lloydia 32, 399-400. Rovelli, B. & Vaughan, G.N. 1967. Alkaloids of Acacia I. Dimethyltryptamine in Acacia phlebophylla. Aust. J Chem. 20, 1299-1300. Occurence of Psilocybin/Psilocin in Pluteus salicinus (Pluteaceae). Mycologia 73, 781-784. Indole Alkaloids in Plant Hallucinogens. J of Psychedelic Drugs Vol 8(1), 7-25. The Botanical and Chemical Distribution of Hallucinogens. J of Psychedelic Drugs Vol 9(3), 247-263. Hallucinogenic Plants: Their Earliest Botanical Descriptions. J of Psychedelic Drugs Vol 11(1-2), 13-24. Schultes, R.E. & Hofmann, A. 1979. Plants of the Gods. McGraw-Hill. Reprint available from Healing Arts Press, Rochester, VT.
Schultes, R.E. & Hofmann, A. 1980. The Botany and Chemistry of Hallucinogens. Springfield, Ill: Thomas. Psychotomimetic agents. In: Gordon, M. (Ed.) Psychopharmacological Agents, Vol IV. New York: Academic Press. Chemistry of Psychotomimetics. In: Hoffmeister, F. & Stille, G. (Eds.) Handbook of Experimental Pharmacology, Vol 55: Alcohol and Psychotomimetics, Psychotropic Effects of Central-Acting Drugs. New York: Springer-Verlag. Shulgin, A.T. & Shulgin, A. 1997. Tihkal -- The Continuation. Berkeley: Transform Press. Skaltsounis, A.L., Tillequin, F. & Koch, M. 1983. Plantes des Nouvelle- Caledonie LXXXIII: Alcaloides des tiges feuillees de Melicope leptococca. Lloydia 46(5), 732.
Review: Tryptamine and Related Compounds in Plants. Phytochemistry 16 171-175. Clinical Observations on the Effects of Panaeolus venenosus Versus Psilocybe caerulescens Mushrooms. Mycologica 51, 49. Stijve, T., Klan, J. & Kugper, W. 1985. Occurrence of psilocybin and baeocystin in the genus Inocybe. Persoonia 12, 469-472. Stijve, T. & De Meijer, A.A.R. 1993. Macromycetes from the state of Parana, Brazil. 4. The psychoactive species. Arquivos de Biologia e Tecnologia (Curitiba) 36(2), 313-329. The Pineal Gland: Current Evidence For Its Role In Consciousness. In: Lyttle, T. (Ed.) Psychedelic Monographs and Essays Vol 5. Thompson, A.C., Nicollier, G.F. & Pope, D.F 1987. Indolealkylamines of Desmanthus illinoensis and Their Growth Inhibition Activity. J Agric. Food Chem. 35, 361-365. Wahba, S.K. & Elkheir, Y.M. 1975. Dimethyltryptamine from the leaves of certain Acacia species of northern Sudan. Lloydia 38, 176-177. Wassel, G.M. et al. 1985. 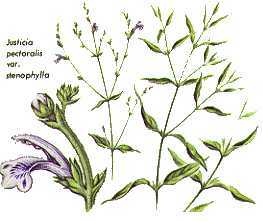 Alkaloids from the rhizomes of Phragmites australis Cav. Scientia Pharmaceutica 53, 169-170.
v1.0 - 1991 - Petrus Pennanen - Usenet FAQ, actively maintained for several years . v1.5 - 1999 - PP, Various - Last major update. v1.9 - 2014 - Erowid - Added unmaintained notice, added note that Hygrocybe psitticina is not considered to contain psilocybin and related compounds.